Find out how one of Anne & Gilbert’s most popular ballads started out as a salsa number destined for another musical. That’s one of the stories in a revealing conversation with Bob Johnston, lyricist and composer. “All You Can Do Is Wait” is one of the powerful ballads in the show. It’s developed quite a life outside the show as a popular audition piece for male singers. Why do you think that is? Actors are always looking for audition pieces that are short, and that pack an emotional punch. “All You Can Do Is Wait” starts gently and rapidly hits a climax in the first chorus. And the message is; “I love you, but I can’t tell you that I love you, so all I can do is wait.” The verses describe a patient man. The choruses describe a desperate man. Plus it’s a song that can come out of the show, meaning, that there are no lyric references that are specific to the characters or to the plot. What are your memories of writing that song? Not what you’d expect. Many years ago, Jeff (Hochhauser) and I were approached by a gentleman to write the score for a “Dennis the Menace” musical. We wrote several songs but pulled out of the project when it became clear there were no guarantees we would be paid. So we never presented him with the material, and we put the songs in the trunk. One of the songs was an elaborate and comic pseudo-mariachi number called, “Adios Estates”. It was sung by a Mexican gardener at a retirement home and it had several melodic themes to it. That’s where the music of the verse came from, although the Latin inflections have been disguised in Avonlea. Once I started to work on that melody and develop it, I thought, how would Gilbert sing it if Gilbert was Bruce Springsteen? What are your songwriting influences? I’ve been influenced by every great song I’ve ever heard.When I was a kid, the cast album of “My Fair Lady” was in the house and I played it hundreds of times. But my biggest influences are the Beatles and Steven Sondheim. Their music influenced me almost immediately. The first time I heard the cast album of “Sweeny Todd”, I was as struck by it as I was struck by “Sergeant Pepper”. Nancy White is another big influence. I have played piano for Nancy for many years. Her melodies are beautiful and her lyrics are moving and as witty as she wants them to be. Do you have a specific approach when writing a song for the stage? I studied musical theatre writing at NYU and participated in the UK Workshops and Dramatists Guild Workshops for two and a half years in New York. That’s where I met Jeff. So I adhere to rigid principles of lyric writing for the theatre. No false rhymes, no missed accents and let the character sing like the character, with the best melody I can come up with. What was the most challenging song to write? “A Jonah Day”, because I had to pull out all of my writing and arranging stops and because no other song so fully involved all three of the writers. Jeff structured the number as a musicalized scene. Nancy wrote the music and lyrics for the main part of the song, I wrote the connective music that takes place inside the school for which Jeff and I wrote lyrics and I wrote the music for Nancy’s lyrics in the “Josie Pye has done her homework…” section. I transcribed our piano music and we hammered out the choral parts. So personally, I got to do all of my jobs in this one number. I was even able to incorporate a vamp that I have used and removed from two previous musicals. And for me, one of the most thrilling musical moments in the show is when Anne sings Nancy’s final 38 bars. It’s operatic, melodramatic, painful and funny. And when Marilla steps on Anne’s climax, what a scene! You’ve seen many live performances of Anne & Gilbert. Any audience reaction moments stand out in your mind? 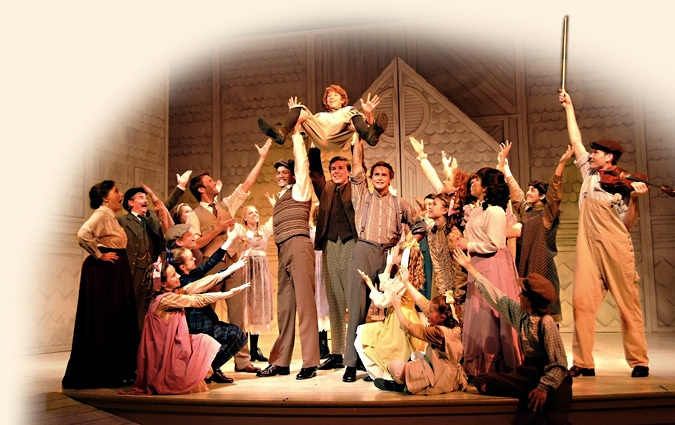 The single most important audience reaction for me was the response that erupted at the end of “Forever In My Life”, opening night at the Victoria Playhouse (August 4, 2005). The show improved with each preview but that moment didn’t work until opening night. That completed the arc of the story and it allowed us to tinker and solidify the end of the show since then. And I love kids in the crowd. The energy and enthusiasm that children bring to an audience is icing on the cake.